The Japanese Beetle is a highly destructive plant pest that can be very difficult and expensive to control. Feeding on turf grass roots, Japanese Beetle grubs (larvae) damage lawns. 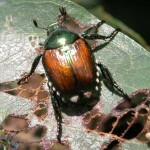 The adult beetles attack the foliage, flowers, or fruits of more than 300 different ornamental and agricultural plants. While most of the damage to plants is done by late summer, this is the time to treat lawns for grubs.